1996, together with another sister, being the first members of the Holy Trinity Baptist Church in Bals. Position: Since 2017 I am a servant / devoted worker in the local church. Family: I'm married, my wife is called Emilia and we are teachers at a school for children with need special in the city. The town of Bals has a population of nearly 20,000 inhabitants, it is located halfway between Craiova and Slatina (25 kilometers) and has an adequate transport infrastructure. Besides the Orthodox church, the majority, there are also Baptists, Pentecostals, Adventists, Yehova's witnesses. 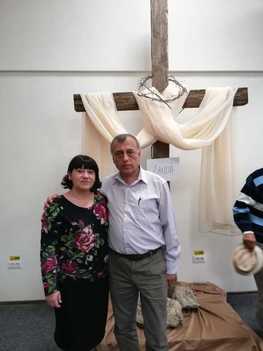 Vision: Baptist Church "Holy Trinity" Bals wants to be permanently connected with the workers and missionaries from the Oltenia area, from the country and everywhere, with whom they can confess the Savior Jesus Christ, the one who turns lives and forgives sins! Strategy: Attracting missionary workers, both from the country and abroad, for the Balş area, but also for the communes close, interacting with people and having the opportunity to have them know the needs and to proclaim the gospel. The church has opportunities. Description work: In the local church, which has 18 members, the following works are performed: praise and worship, pastoral work, biblical study, evangelism, helping poor families. We want to start in soon an English language course for children and young people.